This is the last of another Wine & Movie Pairing round. I can't believe it's already been three weeks! Robin Williams is one of my favorite actors so I hope you've enjoyed this round as much as I have. ClubW really delivered on the wine this month too. I have to say I enjoyed every single bottle. To wrap up this round, we have Good Will Hunting and a really tasty red wine from Italy. I've never seen Good Will Hunting but I've always wanted to. When it was $4 at Target not too long ago, I grabbed it and decided it had to be one of the films for wine and movie pairings. I'm glad I did because this was a match made in heaven. 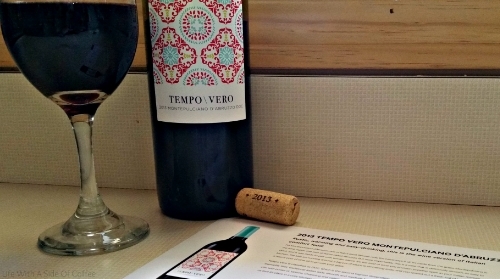 The 2013 Tempo Vero Montepulciano D'Abruzzo comes from Montepulciano, Italy and has a signature scent that consists of chocolate covered cherries, prosciutto, vanilla cake, raspberry sauce and chili powder. ClubW says, "For Montepulciano D'Abruzzo, one of Italy's most famous reds, the name says it all. It's made from the grape Montepulciano in the wine region due east of Rome called Abruzzo. But more importantly, this is a wine that is deliciously smooth, so easy to drink, and it was made to pair with tomato sauce. It's the kind of wine you envision popping open in your Italian mama's kitchen...the kids are running around, a big pot of sauce is simmering away, and you spread out a fresh loaf of bread and a hearty pour of olive oil to go with your glass. Tempo Vero is classified as DOC, which is the second highest designation a wine can get in Italy. It's classic flavors exemplify their traditional Italian reds; smooth and medium-bodied with tart cherry notes that won't overwhelm you with power or tanins. Charming and calming in its simplicity, it is the rustic beauty of this wine that makes us love its place in a cozy kitchen versus on some fancy-schmancy white tablecloth." I really enjoyed this wine. Red wines are touch and go with me as I find my favorites and learn which varietals I'm not too fond of. This one was light but bold. You could really taste the raspberry influence and the finish had just a pinch of spice that I loved. It wasn't a terribly heavy red which I loved. It was lighter but with really strong flavors. I don't see where the prosciutto comes in here but it would pair nicely with it. I was able to get hints of raspberry, plum and cherry on the nose and then I tasted cherry, plum and a lot of raspberry with a bit of a spice at the end. It was smooth just like the description mentioned and paired really well with stuffed peppers, coming up on Cooking With Stanley soon. Have you ever seen Good Will Hunting? It's a phenomenal movie that deserved every single award it won. It's one of my all-time favorites. Ben Affleck and Matt Damon are both incredibly talented and I am so happy they were given a chance when they presented this idea. But let's talk about the star of this round, Robin Williams. Every time I see him in a movie I haven't seen before or I see him in a movie I haven't seen since I was a kid, I'm blown away. His talent has no limits. We started with Mrs. Doubtfire where we got to see a little of his serious side but a lot of his funny personality. With What Dreams May Come, we saw a very deep, serious side of him that I hadn't experienced before. It was very introspective. This time, with Good Will Hunting, we see that serious side again but differently. Sean is a tortured soul due to the death of his wife, the love of his life. Will challenges Sean to see outside of the world he built for himself out of security. And Sean forces Will to forgive himself for the things done to him as a child. The scene where he repeats over and over, "It's not your fault" tore me to pieces. This intellectual character that Robin portrayed with wounds still open from the past was a different side of him that I hadn't seen before and I enjoyed it. It makes me sad to think of the talent we are inevitably missing because of his death. What other films would he have made had he not died? But we are so lucky he shared his talent with us in the films he did make and they will certainly never be forgotten. Many of them, including Good Will Hunting, are already classics. The last two posts I totally bombed on the pairings but this one I paired perfectly. I went off intuition since I never saw this movie and boy was I right. Good Will Hunting has some sad parts that really effect you in the gut but it also has some comedy to it. It's not all sad. Will has a tough life but he's given a new beginning, something that his friends will never have because they don't have his gift. Sean creates his own new beginning because of meeting Will. Had they never been forced into therapy sessions together, he's still be teaching at a community college doing other things here and there. Instead, at the end of the film we see him preparing to travel. 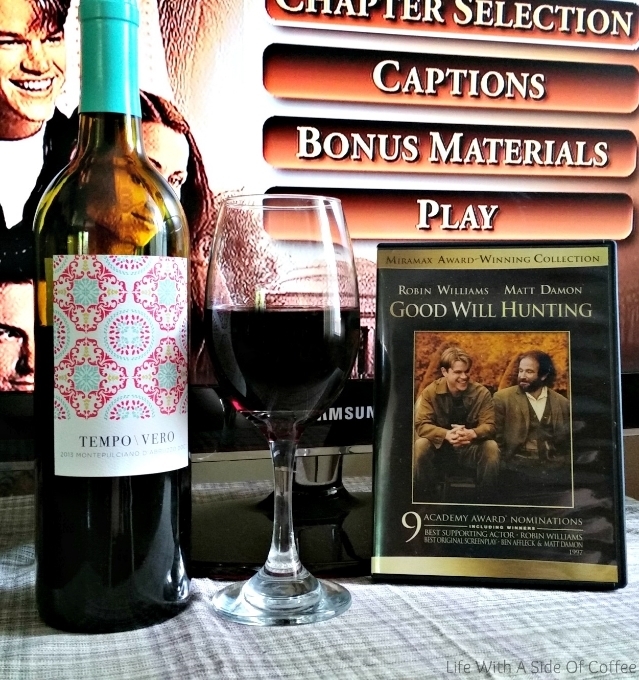 Good Will Hunting was meant to be paired with a light but bold red wine. Not too intense to be paired with a deep red but not light enough to go down to a rose, this film and the Montepulciano were perfect for each other. A perfect combo: my new favorite movie with my new favorite red.